Associate: Rev. Shibu P. Devassykutty, C.M.I. 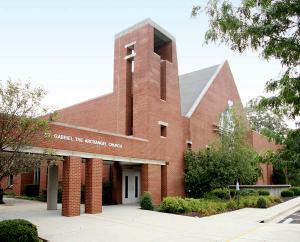 Mondays — 9 a.m.–9 p.m.
As the number of Catholics in the Fern Creek area grew and General Electric opened in nearby Appliance Park, Archbishop John A. Floersh established St. Gabriel Parish in 1953. Late that year, the pastor was presented with $4,800, collected by residents of Fern Creek since 1909, to help construct St. Gabriel church and school. Father James G. Emrich was the first pastor. In the beginning, Mass was celebrated in Fern Creek High School’s auditorium. On 8.5 acres, construction began on a combination church and school. A rectory was completed in 1954. Then, as now, the men and women of the parish donated their time and talent to hold down building costs. Today, St. Gabriel is one of the largest parishes in the Archdiocese with 2,078 families (6,558 parishioners) and one of the largest schools in the Archdiocese, with 723 students (preschool-8th grade) and a religious education program of 74 students. In 1994, an ambitious building program was completed. It included a church, a multi-purpose building, and the renovation of the former church for school classrooms and parish staff offices. In August 2001, further renovations and additions were done to kitchen, cafeteria, library, computer rooms, classrooms, childcare area, parish offices, and work areas. In the summer of 2015, an extensive preschool renovation was completed. The new facility accommodates up to 103 three-year-old and four-year-old students for full-time preschool and Junior Kindergarten, and up to 200 students in the after-school-care program. In May 2018, we opened a half acre Natural Playpark, the first of its kind in the Archdiocese system, which includes fourteen interactive play areas such as a sand play area, slide and Ga Ga ball court. Lay involvement in the mission and ministry of this largest parish in the archdiocese is more important than ever. Parishioners give their time and talent to building up the local community, living St. Gabriel’s mission of praising God, proclaiming the Good News, serving others, and building community.